Alampur is a temple-town situated in Jogulamba Gadwal district, in the state of Telangana, India. Alampur is the meeting point of the sacred rivers Tungabhadra and Krishna and is referred to as Dakshina Kashi (also known as Navabrahmeshwara Theertha) and the Western Gateway of Srisailam, the famous Shaivite (Shaivism) pilgrim centre. The Sacredness of Alampur Temple is mentioned in the Skanda Purana. The principal deities at Alampur are Brahmeswara and Jogulamba. It is surrounded by the Nallamala hills. Alampur is situated on the left bank of the Tungabhadra river. The Alampur temples are listed as an archaeological and architectural treasure on the official "List of Monuments" prepared by the Archaeological Survey of India under The Ancient Monuments and Archaeological Sites and Remains Act. 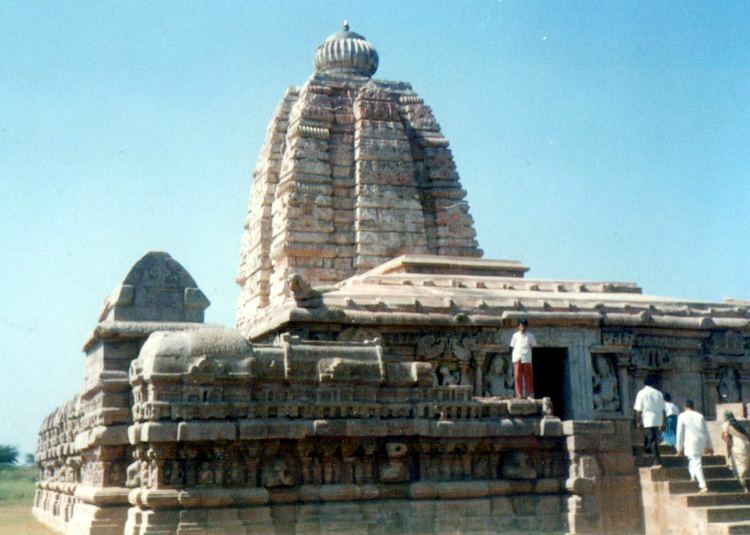 Since the original area of the temples at Alampur came under submergence due to the building of Sri Sailam Hydro-electric Project, the temples were relocated to a higher place. The uniqueness of this group of temples lies in their plan and design in the northern architectural style introduced by the Chalukyas of Badami between AD 650 and 750. The Yogamba (Jogulamba) temple is regarded as a Shakti Peetha where Sati Devi's upper teeth fell. The mythology of Daksha yaga and Sati's self immolation is the story of origin of Shakti Peethas. The original temple was grounded by Muslim invaders in 1390 A.D. Later the temple was rebuilt after 615 years. Shakti Peethas are shrines which are the most divine seats of the Mother Goddess. The body parts of the corpse of Sati Devi has fallen in these places, when Lord Shiva carried it and wandered throughout Aryavartha in sorrow. There are 51 Shakti Peeth linking to the 51 alphabets in Sanskrit. Alampur Navabrahma Temples are located at Alampur in Telangana. There are a total of nine temples, dedicated to Shiva. These temples date back to the 7th century A.D and were built by the Badami Chalukyas rulers who were great patrons of art and architecture. The Sacredness of Alampur Temple is mentioned in the Skanda Purana. It is mentioned that Brahma performed a strict penance here for Lord Siva. Lord Siva appeared before him and blessed him with the powers of creation. Therefore, the name Brahmeswara. Alampur is located at 26.02°N 78.79°E﻿ / 26.02; 78.79. It has an average elevation of 159 metres (521 ft). According to The Imperial Gazetteer of India, Alampur was a taluk of Raichur district, Hyderabad State. It has an area of 184 square miles (480 km2) in 43 villages. The population in 1901 was 30,222, compared with the 27,271 in 1891. Alampur, the headquarters, had a population of 4,182. Krishna river separates the taluk from Mahbubnagar district on the North and the Tungabhadra from Madras state. The confluence of these two rivers is situated in the extreme east of the taluk, formerly at Kudavelly Village. The Kudavelly Village has been submerged now due to construction of Srisailam dam. Sangameshwara Temple was originally located at Kudavelly village at the confluence of two mighty rivers - Krishna and Tungabhadra, which is pretty close to Alampur. Sangameshwara is derived from the word Sangam meaning confluence. Hence the temple is also known as Kudavelly Sangameshwara Teample. It is said that Sangameshwara Temple was constructed by Pulakesi I ( 540 CE to 566 CE) and is fine example of Chalukyan Architecture. When Srisailam Hydro Electric project started, Andhra government decided to shift the Sangameshwara Temple to a location outside the reservoir limits. The project of shifting the temple was entrusted to Archaeological Survey of India (ASI). ASI documented the temple design, dismantled it block by block, moved the material to outskirts of Alampur from Kudavelly and assembled it and restored it to its original form. As of 2001 India census, Alampur had a population of 9350. Males constitute 54% of the population and females 46%. Alampur has an average literacy rate of 61%, higher than the national average of 59.5%; with 64% of the males and 36% of females literate. 16% of the population is under 6 years of age.